The office of Egyptian President Abdel Fatah al-Sisi reportedly expressed support for Libya’s renegade Gen. Khalifa Haftar on Sunday during a visit by the latter, occurring as his troops continue an ongoing invasion against the internationally-recognized Libyan government in Tripoli. 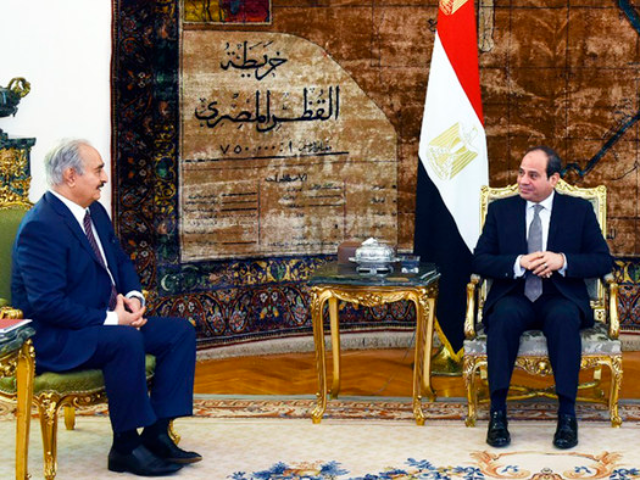 On Sunday, Sisi’s office declared, “The president affirmed Egypt’s support in efforts to fight terrorism and extremist militias to achieve security and stability for Libyan citizens throughout the country,” the Agence France-Presse (AFP) news agency reports. Propped up by Russia, France, Saudi Arabia, and the United Arab Emirates (UAE), Haftar and his Libyan National Army (LNA) have seized most of the North African country. Gen. Haftar has surfaced as the primary rival of the U.N.-brokered GNA, backed by most Western countries. According to the World Health Organization (WHO), the fighting in Tripoli — raging since April 4 — has already killed at least 121 people and injured another 561. Furthermore, the conflict has forced about 15,700 people to flee their homes, the U.N. Office for the Coordination of Humanitarian Affairs (OCHA) revealed over the weekend, stressing that a “significant number” of others are still stuck in battle zones. As Haftar met with Sisi, forces loyal to the internationally-recognized Serraj administration shot down a fighter jet belonging to the LNA, which is fighting on behalf of the breakaway government based in eastern Libya’s Tobruk region. “The downing of the LNA jet came after Haftar’s forces stepped up air raids against pro-GNA troops in recent days as part of a campaign launched on April 4 to wrestle control of the capital,” Al Jazeera reports. “Haftar’s warplanes have been targeting several locations in and around Tripoli and also warplanes with the GNA have been targeting Haftar’s locations south of Tripoli,” Al Jazeera’s ‘s Mahmoud Abdelwahed noted while reporting from the Libyan capital. He said the situation remained “tense” on Sunday. Turkey’s state television channel TRT reported that troops fighting for Serraj, the leader of the U.N.-brokered GNA based in Tripoli, have managed to keep Haftar and his troops seeking to take the Libyan capital at bay. “Haftar’s assault on [Tripoli] … threatens to disrupt oil supplies. The chairman of the Libyan National Oil Corporation warned that supplies faced their biggest threat since 2011 when Nato-backed Libyan forces ousted Muammar Gaddafi,” the Guardian reported. Haftar’s offensive into Tripoli prompted the U.S. military, which is in Libya fighting jihadis, to “temporarily” pull out of the North African nation. While Haftar considers himself an enemy of Islamic “extremism,” his opponents and some media outlets view him as a new dictator in the mold of Libya’s late authoritarian leader Muammar Gaddafi. Human rights groups have accused Haftar’s LNA of war crimes against civilians. The U.S.- and NATO-backed ousting of Gaddafi in 2011 plunged Libya into security and political chaos, allowing jihadi groups like al-Qaeda and the Islamic State (ISIS/ISIL) to flourish while various factions compete for power and influence. On Sunday, Libya’s next door neighbor Egypt joined France, Russia, Saudi Arabia, and the UAE in refusing to condemn Haftar’s ongoing efforts to oust the GNA from its base in Tripoli. France blocked a statement from the European Union blasting Haftar for his deadly operation to seize Tripoli. Echoing some experts over the weekend, security forces from anti-Haftar Italy, Libya’ former colonial master, also warned that the North African country could become “another Syria,” as deadly clashes could prompt thousands more to flee across the Mediterranean to Europe, the Guardian points out. Libya sits a few hundred miles from the European coast. Despite opposition from the international community, the Haftar-allied breakaway government in eastern Libya vowed to press on with the offensive to take Tripoli. “We need to get rid of militias and terrorist groups,” Aguila Saleh, a top eastern Libya lawmaker, declared, referring to forces allied with the U.N.-brokered government, TRT reports. “We assure the residents of Tripoli that the campaign to liberate Tripoli will be limited and not violate any freedoms but restore security and fight terrorism,” Saleh added. The internationally-recognized government has agreed to a truce only if Haftar’s LNA returns east, Mohanad Younes, a spokesman for the GNA, told reporters, according to TRT.